Homepage for the work of Ron Scolastico, Ph.D.
We appreciate any purchases made through the Amazon search link below. We receive a few pennies on the dollar, and it doesn't cost you a thing. 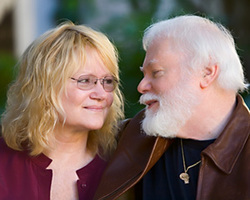 worked together for 30 years, until Ron's death on September 9, 2013, creating a large body of inspired wisdom from workshops, retreats and personal Readings. They have produced 10 books and hundreds of recordings, many of which are yet to be made available to the public. Susan will continue releasing Ron's work through the Study Group Readings. You can subscribe to these monthly Readings here. We invite you to subscribe to our e-Newsletter about the inspired work of Ron Scolastico, Ph.D.
We occasionally e-mail our subscribers with current information; we never share or sell your email address or private information.